Capture the heavenly hush of fresh fallen snow with a tablescape from the January/February issue of Southern Lady that’s draped in lovely layers reminiscent of winter. Once the jubilation of a new year settles, take note of the season’s quieter side for table inspiration. Dress up a simple duo of blue and beige runners with an overlay of heirloom doilies joined together end-to-end. Then continue to wintery charm with icy-blue plates from Sugarboo Designs. Crafted by hand, each features a freeform edge and beautiful patterns made from pressing lace into clay. 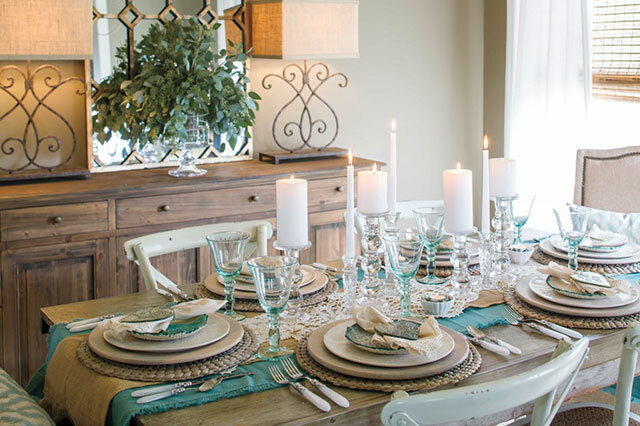 For a final flicker of frosty allure, cluster a variety of glass candlesticks as an effortlessly elegant centerpiece. 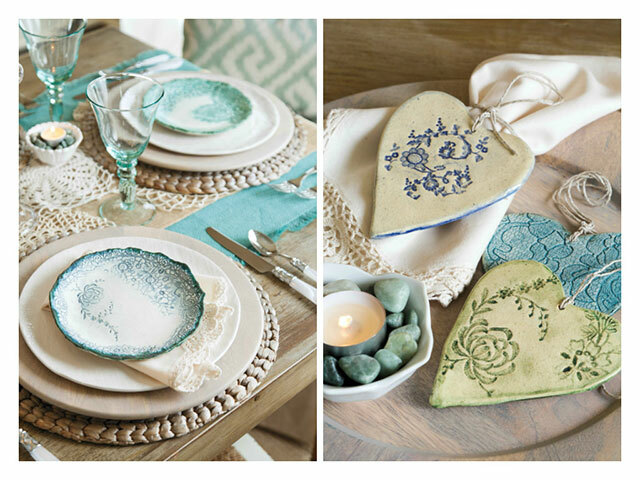 How and where do you find inspiration for your table settings? After New Years when the Santas have been put away & the Christmas trees come down, I have a small space on the callander before Valentine’s Day to bring out my Snowman collection. Tables are draped in white, red candles and plaid ribbons are replaced with white and my silver collection goes on display. I like how it looks with the greenery that is still fresh enough to keep. 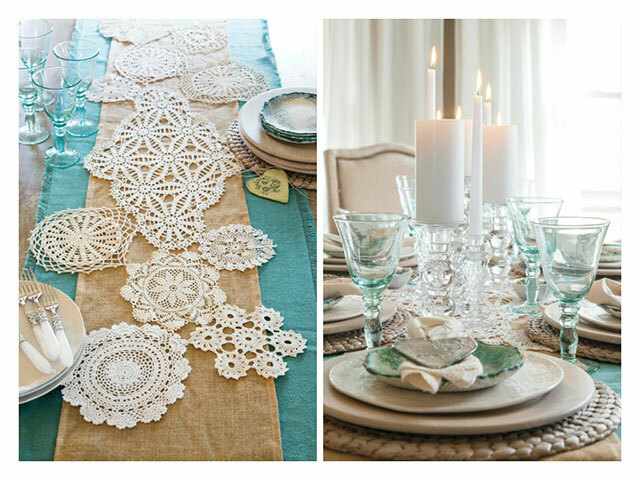 The table looks just beautiful and the doilies are just the right touch. Have you ever seen handmade lace? My Daughter was a foreign exchange student when she was in high school and lived in France for a school year. She brought me home a hand made lace runner from Belgin. It is such a work of art as every tied knot was weaved by hand to make the lace then the lace was twisted and turned to create the runner. Everything done by hand. Every stitch can be seen as this is a treasure for me. So very beautiful Phyllis. I love the colors. Setting a lovely table is important to me and now I have some more ideas. Love the winter theme. We keep it long after the Holy Family and Santas are packed away until next year. I’ve gotten so many wonderful ideas from you magazines and have enjoyed your change of the seasons. I always look forward to your blog. This is exquisite Phyllis, and I love the colour scheme. After all the Christmas decorations have come down I like to keep a winter decor going…I usually stick to blues, whites, silver and gold…your table setting has inspired me! I usually get ideas for the tablescape from the theme of my dinner party and try to mix and match things I already have. Great use of doilies! They are such an expression of meticulous handiwork. I am going to attempt to replicate this lovely and so serene table setting next week . I adore the individual tiny tea lights at each place setting . The pebbles/small stones – is that sea glass ? So beautiful….I need to see if i can get a copy at my local Barnes and Nobles, otherwise can i order online? You always do such a fabulous job. All the best to you Phyllis in the new year. 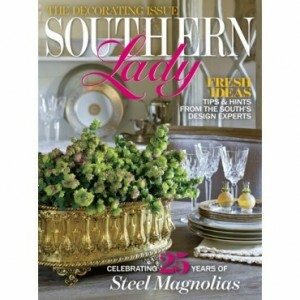 Funny you should ask where our inspiration comes from for tablescape design..Southern Lady never disappoints! Another wonderful reference for seasonal table settings is Cottage Journal. I save both publications and refer to them often. There are many wonderful bloggers who do exquisite jobs with tablescaping. 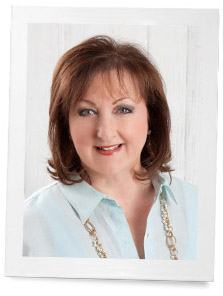 Two of my favorites are Pat from Back Porch Musings and Mary from Home is Where the Boat Is. Thank you, Phyllis, to you and your staff for doing such a superb job! You keep designing, and we’ll keep enjoying!! 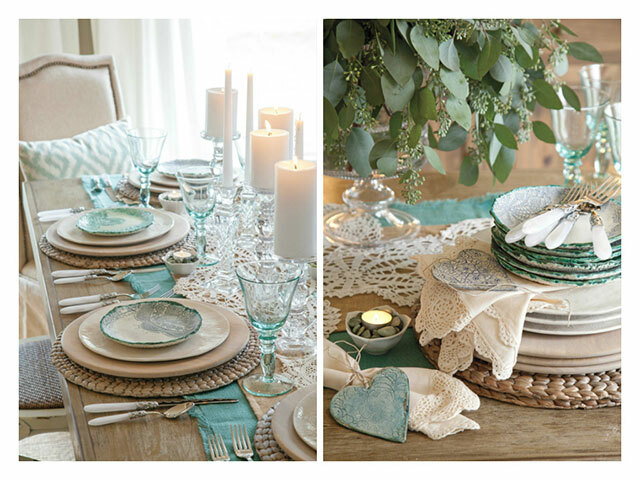 This is one of my favorite tablescapes from Southern Lady – love all the white textures and accents of soft teals! I also love the lamps. Beautiful.